Product prices and availability are accurate as of 2019-04-14 04:08:25 EDT and are subject to change. Any price and availability information displayed on http://www.amazon.com/ at the time of purchase will apply to the purchase of this product. Barbie Digital Makeover lets you create new looks for yourself or Barbie and her friends. Input your own digital image into the computer, and choose from hundreds of hair and makeup styles to create endless new looks. 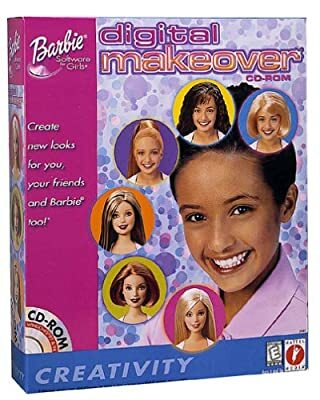 Or make over Barbie, Christie, Kira, and Teresa, for more fun. Use Barbie's magical mixing devices to make your own original textures, colors, and personalized makeup.